Mesoproterozoic basins record the transition between two of Earth抯 earliest supercontinents, Nuna and Rodinia. The North Australian Craton, Mawson continent (South Australia-East Antarctica), and Laurentia were among the largest cratonic blocks in Nuna and Rodinia and many paleogeographic reconstructions show all three cratons in close proximity during the Mesoproterozoic. We utilize the detrital zircon age and Hf isotopic record of Mesoproterozoic basins on these cratons to propose regional correlations that support a new model linking basin formation to major tectonic events during the Nuna to Rodinia transition. The first phase of Mesoproterozoic basin formation followed collision of the North Australian Craton and Mawson continent with Laurentia during the ~1.55 Ga Isan Orogeny. Uplift following the Isan Orogeny is recorded in Australia by deposition of the Roper and Cariewerloo Basins, which contain zircon sourced from 1.60�50 Ga crust of the Isan Orogen and the Musgrave and Hiltaba provinces of the Mawson continent. East-flowing rivers transported detritus from these uplifted 1.60�50 Ga terranes into a 1.50�45 Ga basin system in western Laurentia preserved in the Yankee Joe, lower Belt-Purcell, and PR1 Basins. A major reorganization of sedimentary systems followed orogenesis in southern Laurentia during the 1.49�40 Ga Picuris Orogeny. North-directed paleocurrent indicators and prominent 1.45 and 1.70 Ga detrital zircon populations in the 1.45�37 Ga upper Belt-Purcell Basin and 1.45�33 Ga lower-middle Rocky Cape Group (southern Mawson continent) record uplift of basement in southwest Laurentia and southern Mawson continent in response to the Picuris Orogeny. 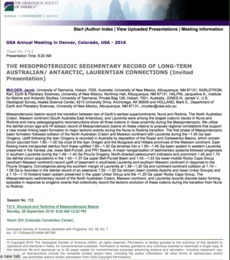 Convergence along the southern margin of Laurentia at 1.38�20 Ga and continent-continent collision at 1.15�08 Ga is recorded in the detrital record of an extensive 1.25�20 Ga retroarc basin (middle Apache and lower Unkar Groups) and a 1.15�10 foreland basin system preserved in the upper Unkar Group and the <1.25 Ga upper Rocky Cape Group. The Mesoproterozoic sedimentary record of the North Australian Craton, Mawson continent, and Laurentia records discrete basin forming episodes in response to orogenic events that collectively record the tectonic evolution of these cratons during the transition from Nuna to Rodinia.